Just like the famous line from Poltergeist II… I’m back!!!! I want to say thank you for being understanding about my time away. Sometime life just has a way of getting in the way of the things you really want to do, like read awesome books! But I’m back now and boy do I have the perfect book to get you ready for my favorite time of year, Halloween! You might have seen previews for a movie about a haunted box, or seen a certain show on a cable network about the same haunted box, but have you read a book about a spirit box?! 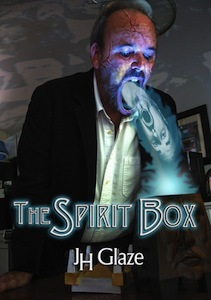 The Spirit Box by JH Glaze tells the story of Walt Turner, whose mother has recently passed away. He has inherited her apartment, his life long home, and the antique shop below. After losing his job, The Spirit Box calls out to him from the darkness of his mothers shop. While Walt is trying to decide if the Spirit Box can make all his dreams come true, Detective John Hazard is investigating a series of murders and missing persons in his quiet town. His reality is about to be altered in a life changing way, which will force him to rethink what is real and what isn’t. The Spirit Box is well written, faced paced book that literally leaves you on the edge of your seat needing to know what happens next! I stayed up way to late several nights in a row because I needed to know how the story was going to end. JH Glaze does a wonderful job of developing his characters and allowing you to understand their motives, even if you may not agree with them. I found myself sympathizing with Walt about his situation and really hoping that he’d know the right thing to do. And I might have even found myself not liking Detective John Hazard, for me he came across as a bit of bad cop, with some questionable ethics for sure. You may not want to look into The Spirit Box because you just might have more than your breath taken away.